Just before the summer break, we would like to present you with our newest antique silver acquisitions. 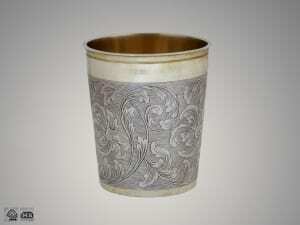 Helga Matzke European Silver possesses a rich collection of beakers and other drinking vessels. We are thus very excited to have enriched our collections with two beakers, both adorned with wonderful and crisp engravings. The first one is a baroque beaker from Augsburg with a slightly tapering corpus and lavish décor. An interesting iconographical programme is being developed between two gilt rings on the rim and the bottom. Two sophisticated and with many details, engraved cartouches show different scenes with architectural settings, while in-between them, there are foliate scrolls and fruit pendants engraved. The present beaker demonstrates the increased interest in landscape painting during the seventeenth century. Travelling towards the South and in particular to Italy, became after the Thirty Years War (1618-48) easier for artists and members of the upper class. Thus, Italian – mostly Roman – ruins inspired Northern European painters. The silversmiths, following the artistic developments of their contemporary painters adopted, pretty fast new habits, decorative elements and styles. Within this context, the present beaker of the maker Johann Jakob Petrus – a maker of objects of outstanding quality and provenance – is a fashionable object of the late seventeenth century. 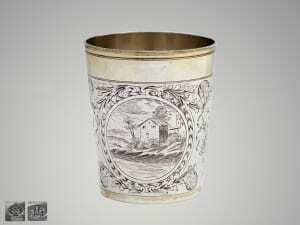 Next to this one, we are excited to show another silver beaker made in Augsburg in the beginning of the eighteenth century. The beaker was made by the master maker Martin Breuer (ca. 1672-1751), who delivered a well-done and elaborately decorated object. It is slightly tapering towards the lower part and within two gilded rings, a middle-field is left in silver and has been fully engraved. In fact, on a reeded ground, there are rich, scrolling acanthus leaves engraved. The beaker is furthermore gilt inside. Our silver collections with royal provenanceare now enriched with an eighteenth-part dessert silver-gilt cutlery set with the monogram of Olga, Queen of Württemberg. The set consists of six spoons, six four-pronged forks and six knives. All parts bear the engraved crowned ‘O’, monogram of Olga of Württemberg and are of an exceptional quality and weight. They were made in Berlin by the master maker Johann Georg Humbert. Olga was born in 1822 as the third child of the Grand Duke Nicholas I, Emperor of Russia and his wife, Alexandra Feodorovna (born Princess Charlotte of Prussia). In 1846, she got married to Charles I of Württembergand became in 1864 queen of Württemberg. Olga was above all actively engaged in the social sector. She founded several initiatives in the kingdom of Württemberg, which still carry her name. She was the owner of many splendid objects made of silver. The Landesmuseum Württemberg in Stuttgart owns – next to other objects related to her – a series of silver objects (e.g. dishes) from the Grenadier-Regiment “Königin Olga” no. 119, which belonged to the army of Württemberg and held Olga’s name from 1806 to 1919. 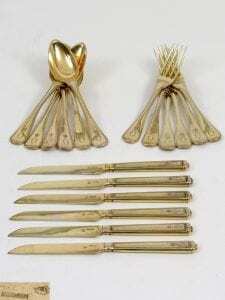 Queen Olga is supposed to have laid the ground stone for the silverware of the regiment with her gift of cutleries. In addition to these, came gifts on the occasion of the departure of officers, which had as a typical feature the crowned monogram “O” of Olga. A Selection from the silver collections of the Grenadier-Regiments 119, “Königin Olga” (“Queen Olga”), Gifts and Works on loan by the Kamerradenkreises Grenadierregiment 119 e.V. as published in Legendäre Meisterwerke: Kulturgeschichte (n) aus Württemberg, p. 223. Last but not least, came a silver coffee pot from the period of the Britannia Standard and a George II silver sugar caster to our collections of English silver. 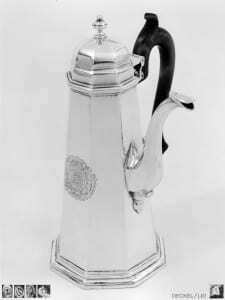 The silver coffee pot is octagonal and has a smooth surface, adorned on one side by an engraved, contemporary crest, framed in a laboriously decorated cartouche. The spout has an S-form, ends up in a bird’s head and is standing at a right angle to the handle. Where the spout connects to the body, there is a beautiful elaborated decorative element. A cast baluster knob adorns the octagonal, high, vaulted hinged-lid. A very fine, geometric coffeepot of timeless elegance! The form of the first coffeepots in England was strongly influenced by the Orient. Early English coffeepots had thus a conical lid with a pointed end. The developments of the period 1710-20 gave the coffeepots quite often an octagonal, very elegant, form. Our coffeepot is a good example for style and period. 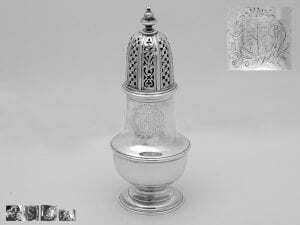 The George II silver sugar caster is made in London in 1733 by the master silversmith Thomas Farren. It has a round pear-shape and is raised on a profiled foot. The engraved armorial –probably belonging to the ordering customer – adorns the one side of the wall. The pull-off cover is pierced, presenting a rich foliations décor, stylised crosses and has a cast knop finial. 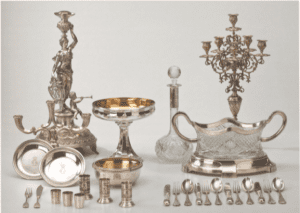 If you would like to be surprised and inspired by historical silver, you may want to have a look at our latest topic ‚Silver and Still Life in Dialogue‘. We would be very delighted, if we have contributed positively to new inspirations. Please contact us, if you would like to know more on one of these here presented objects or on other ones from our broad collections. We wish you a relaxing and interesting summer! The new season will bring for us new events and challenges, for which we will keep you informed.